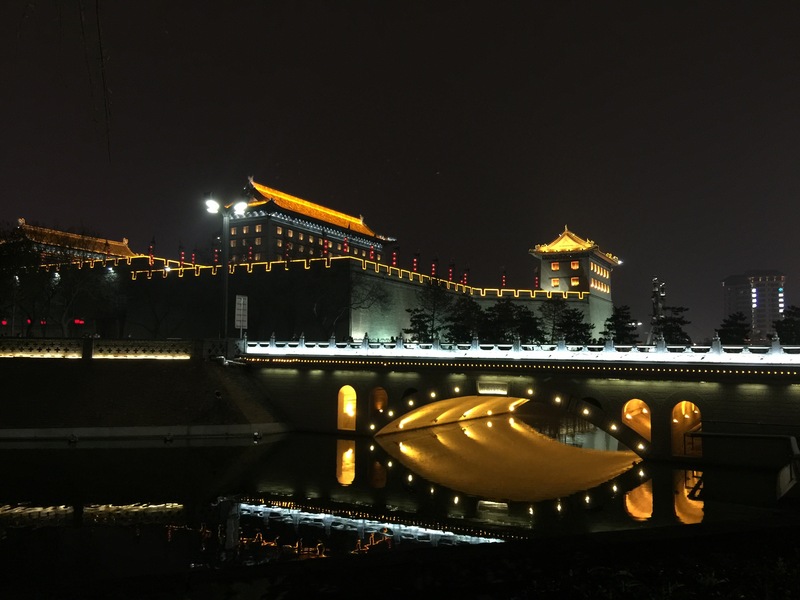 After our overnight train we arrived in Xi’an. After transferring to the hotel we departed for the Terracotta Warriors almost immediately. The archeological site is about an hour out of the town and although everyone was tired, we were excited to see this famous spectacle. A small town has developed around the site that was once just farms. 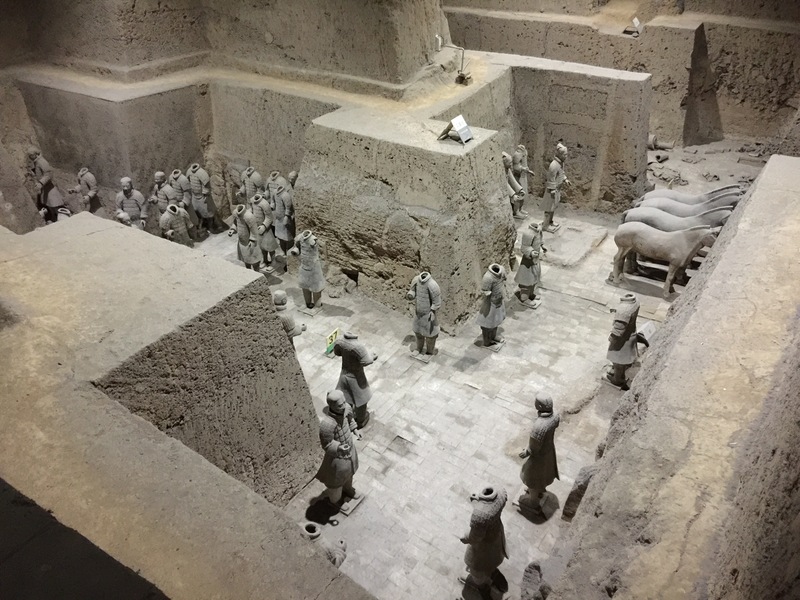 The Terracotta Warriors were discovered by a farmer in 1972 drilling a new well. Since then the site has developed into a major tourist attraction and site of national archeological importance. The Warriors were built as part of Emperor Ming’s tomb to protect him in the afterlife. Over 5000 have been excavated so far and thousands more are thought to be there. The site is divided into 3 main ‘warehouses’. We started with the least impressive dig site 3. 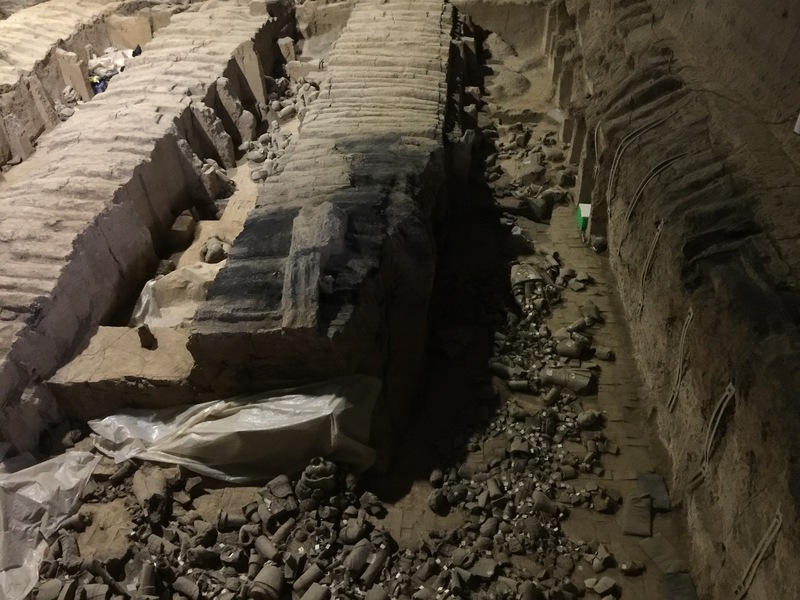 Vast in size but what has been uncovered so far was a mix of broken terracotta warriors, horses and chariots. As you look down from above, a few distinguishable parts were visible but most was destroyed. A few years after the emperor and his tomb were sealed a peasant revolt destroyed much of the tombs and warriors. Around the edge there were however restored warriors of different ranks and even a digital green screen to put yourself amongst the army. The next ‘warehouse’ housed dig site 2, and was more impressive. Whole warriors stood excavated in the pit, in lines and groups. Again you looked down at the excavation in a dim light so photos were difficult. Especially as I don’t know how to use are camera properly! Different generals and ranks could be seen, distinguishable by their beards and clothing. Finally we moved into dig site 1, the original where the farmer discovered the first warriors. This was by far the most vast ‘warehouse’ and included the famous shot of thousands of warriors all stood in rows. We walked around the edge and finally up onto the famous platform. 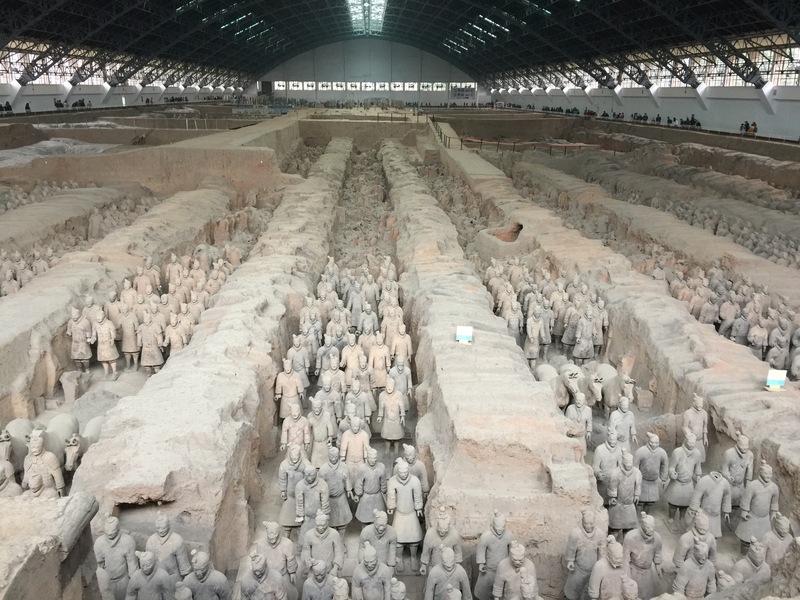 Here you could see thousands and thousands of warriors all facing the same direction, horses (their wooden chariots having rotted away) and generals. Pictures can’t do the scale any justice. After taking our photos we watched a short film about the Emperor and the creation of his army. The film was very Monty Python in its reaction of battles and style. We ate a late lunch at a local families house, eating traditional Chinese dishes which were very tasty on the whole. Walking back to the bus we walked through a market selling all sorts, most notably fur: fox and bear amongst others. Back at the hotel we relaxed and in the evening went out for dinner and drinks which all ended far to drunkly. Although we did get to see the city at night. The next day was supposed to be an explore of the city and a cycle on the ancient city wall. The only complete one in China. However the heavens had opened and it made exploration and cycling impossible (hangovers aside). We continued that day on a bulletin train to Suzhou, a small city outside of Shanghai know to be the Venice of the East. As we explored in the rain the following day we didn’t see much evidence of this. There were a few canals but nothing as pretty as Venice. Perhaps this was due to the weather or the season. We also explored the Master of Nights Garden. 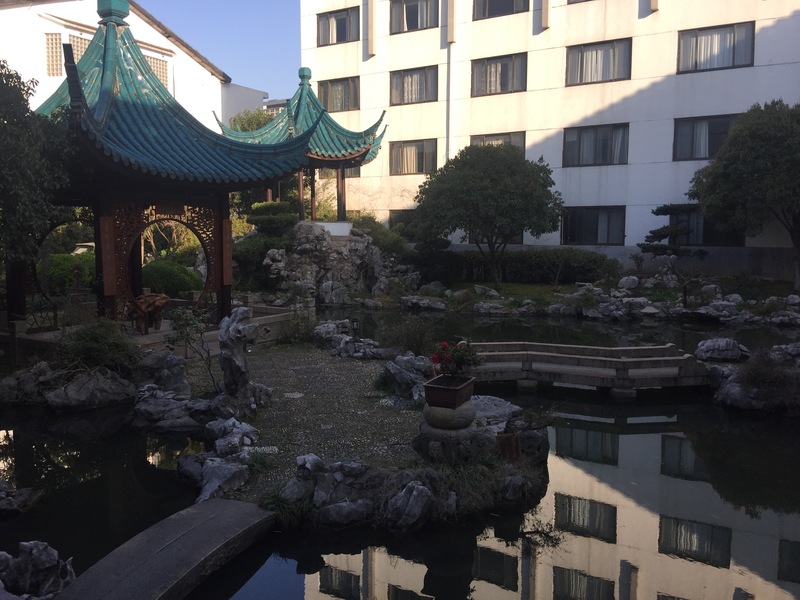 A traditional Chinese garden built a thousand years ago by a nobleman. Quaint bridges and flowing water gave it good fengshui and a few nice photo opportunities. Our next destination was Shanghai and we were keen to see how it would compare to Beijing.